Candy Fair 2013: Music Festival! I'll always hold and keep good memories when it comes to Candy Magazine. Pag usapang course choice (Journalism) or my blogging or why Anagon brand boomed, I'll always tell people how Candy helped me realize these dreams back when I was still young and trying to find my way (naks). The teen glossy also generously gave me writing exposures with by-lines, and lots of accessories features (a pair of Anagon earrings even made their cover one time!). Aside from these, I also involved myself in past Candy Fairs when they still allowed selling booths. Tapos Candy Council of Cool member pa ako that time - in short, "Certified Candy Girl" na talaga ako! :) Certified Candy Fair! Teen Talk! Me, Only Better! Candy Wink! Best-est friend you'll ever have! Memorize ko lahat niyan! Went to the recent Candy Music Festival last Saturday, geared with my floral headband and boots, para fair-ready talaga...And para mag-blend sa mga bagets! Hahaha (I tried!!! ;p). When I got there, Paul and I had late lunch muna in his car--Coachella-style daw! Haha! First snap was given to me, of course, hahaha. ;p Test shot lang yan though, hehehe. Cute nila noh! :) Candy Girls love their OOTD instax-style! Dani trying out my Anagon Red Roses Headband..Cute! Also had the chance to watch from the backstage where I saw PBB boys James Reid, Kit Thompson, and Yves Flores, and Youtube sensation Luigi D' Avola. Wasn't able to take photos, though. :p The Candy Music Festival ended with a prod number with all the Candy Cuties, a festive shower of confetti, and autograph signing with the guest celebs. Had dinner in Borough with Paul, Tracy, and her friends Jasmine Curtis and Sam Concepcion--napaka-surreal nga naman na dinner noh! :p Wasn't able to tell Sam pero I remembered the Candy Fairs na sa kanya ang pinaka malakas na tilian! ;p Those were the days! @clararosales even tagged me to an old Candy feature, hahaha! Grabe 6 years ago na to! And of course, do get your copy of October Candy Magazine, with it-girl Julia Barretto on the cover! --tapos pag finlip mo the pendant, it says "Forever". Awwwww! I still buy Candy - yun past issues sa Booksale. Sabi nga nila Once a Candy Girl always a Candy Girl! Aww!! I can't believe I missed this event. Major sayang! Bakit kasi may class ako ng Saturday and whole day pa huhu (makarant lang). Pero thanks for sharing your experience sa Candy Fair, sis!! 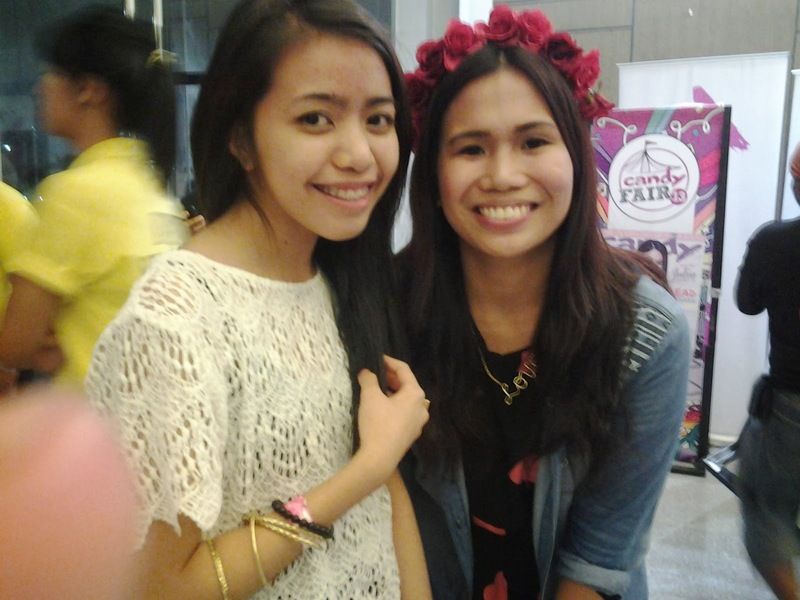 :) And I love your outfit, bagets talaga and with flower crown pa! Super hipster!